Just south of the historic Moorish city of Granada, The Lecrin Valley is a lovely green, orchard-covered area at the foot of the dramatic Sierra Nevada mountains and within half an hour of the beautiful Costa Tropical. Perfect as a holiday destination, it’s away from the hustle and bustle of the coast, yet within easy reach, and only a short distance to the city of Granada. Driving times are about 1 hour 15 from Malaga (with the newly completed motorway), 35 mins from Granada airport, 20 minutes to Granada city and 25 minutes to the Costa Tropical. El Pinar: Pinos del valle, Ízbor. El Valle: Melegís, Restábal, Saleres. Lecrín: Acequias, Chite, Béznar, Mondújar, Murchas, Talara. 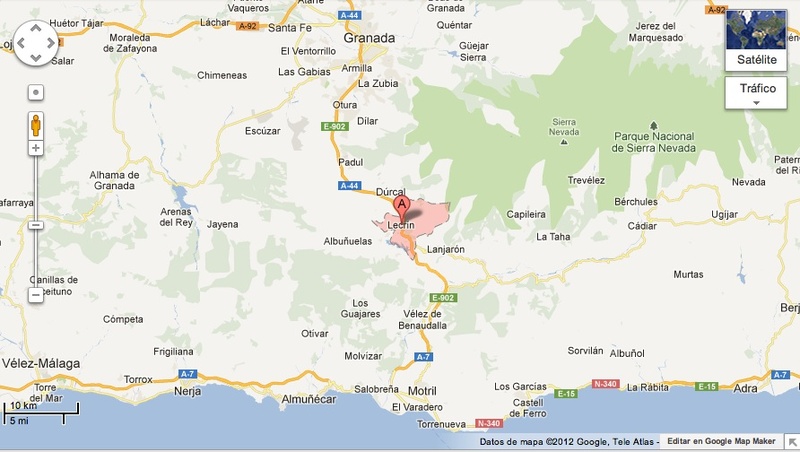 For more information on the area go to http:/www.adurcal.com; http://www.elvalle.es and http://www.eslecrin.es/ . Only Adurcal is in English though. According to Wikipedia: “Lecrín is derived from the Arabic Iqlim, meaning “gateway”: this refers to a small area of land situated between the villages of Mondújar and Talará, which controlled the access to the vast coastal areas of sugar production in Moorish times”. However, the other school of thought is that El Valle de Lecrin actually means “Valley of Happiness” and this is how the residents like to think of it! Apart from Dúrcal and Padul, which are the area’s biggest and busiest towns, agriculture and farming remain the principal occupation with pine, citrus, almond, olive and grape as the main crops. (Click Here for an article on Durcal Ayuntamiento’s website, www.adurcal.com on the history of farming in the area). In more recent times it has become a popular destination for Spanish and international holidaymakers looking for a quiet and relaxing holiday amongst the orchards, but with easy reach of the city of Granada and the relatively unspoilt Costa Tropical. An area of outstanding natural beauty, the Lecrin Valley is famous for its verdant landscape (due to the melt-water run off from the Sierra Nevada), its citrus groves, its walks, birdlife and amazing spring colours. Oranges, lemons, figs, pomegranates (in Spanish – granadas) and cactus line the roadsides. Steeped in history it’s been populated since neanderthal times according to archeologists, was a popular destination for the Romans who built baths here (there are still ruins of some in Mondujar) due to the thermal springs. It then spent decads under Moorish rule, with the last remaining Nasrid Queen being buried under the historic church at Mondujar. Ruined fortresses and Moorish castles pepper the landscape and the villages are still full of the same Moorish architectural influences as seen in the region’s capital, Granada. It was also a key region in the Spanish Civil War and while that part of the nation’s history is not particularly talked about, there are references to the struggle in many of the villages’ statues, fiestas and buildings. See History page for a comprehensive article on the History of Lecrin. Thank you for a great article. My wife and I just got back from a winter trip to Spain and enjoyed Granada very much. Moorish history was very moving. People were wonderful every where, as well as food and lodging. We were in the crowd in Barcelona at midnight on December 31st, and on Three Kings day, was all exciting and fun. The Segrada Familia was beyond description. Hola Bob! Glad you had a fantastic time. Don’t forget to spread the word and come back to visit! Hi Sophie, we’ve just come back from a good November holiday in the Eastern Alpujarras (very quiet) and are now eager to explore the Lecrin valley in the Spring. We want to base ourselves in a small town with Spanish street life, a couple of cafes, a couple of restaurants, a town square perhaps and things going on. We’d like to find accomodation within walking distance of the town centre with a terrace and a good view. We like to walk, but not too strenuous. Which of the villages or towns would you recommend? Public transport links to Granada and the coast would be ideal Would appreciate some advice. Noella Smith. Hi Noella – to be honest most of the villages answer this brief! However I would say Restabal, Melegis, Niguelas or Chite (Walk into Talara) might be the best for you. If you look on websites like owners direct, home away and also the Lecrin website, Viasur, you are bound to find a few houses… There is a bus that goes up to Granada from the coast and back down again, and also that goes through the main villages too (not through Chite but past the end of it). Not sure about Niguelas.. You can find the route on https://www.alsa.es And go to “Horarios”. Hope that helps. Sophie. Think Niguelas is perfect , you can walk into Ducal the local town, whilst walks, bars and village life Spanish style is all around you. Also has a local bus service, although the village has plenty to keep you rested and relaxed .